A few years ago I had a serious coke problem. Not the powdery white stuff, but the corn syrup-sweetened chemical syrup available everywhere in the US. One of the things that finally helped me kick my soda habit was learning to always keep a pitcher of iced tea of varying types and flavors in my refrigerator. 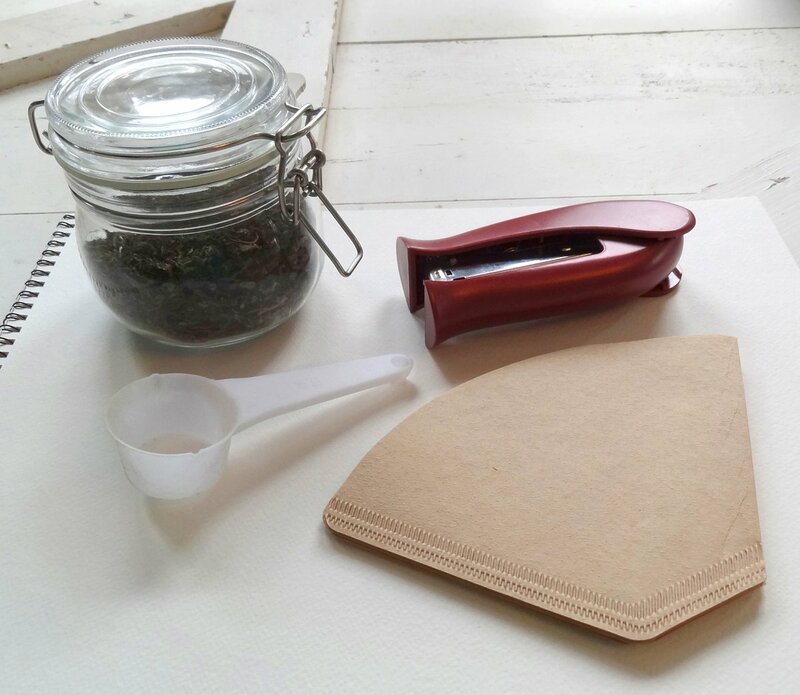 Rather than substituting my pop habit with juices and lemonades, I started experimenting with cold-brewing tea. Fact: ALL teas can be cold brewed. 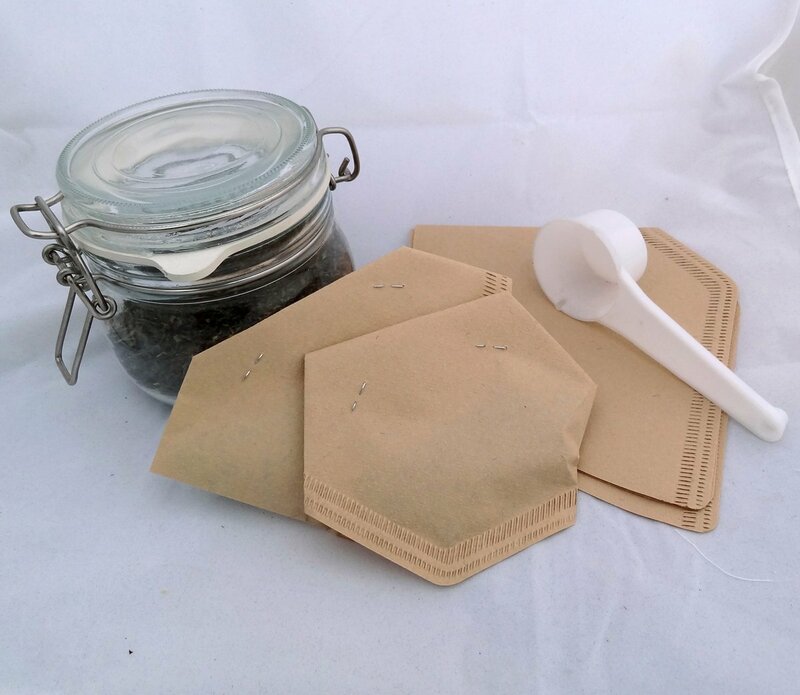 Though marketing would have you believe that you have to pay more for teas that can be cold brewed, all teas can be brewed in cold water, if allowed to sit for about 6-8 hours. A pitcher of cold water placed in the refrigerator with tea bags at night is fully brewed by morning. 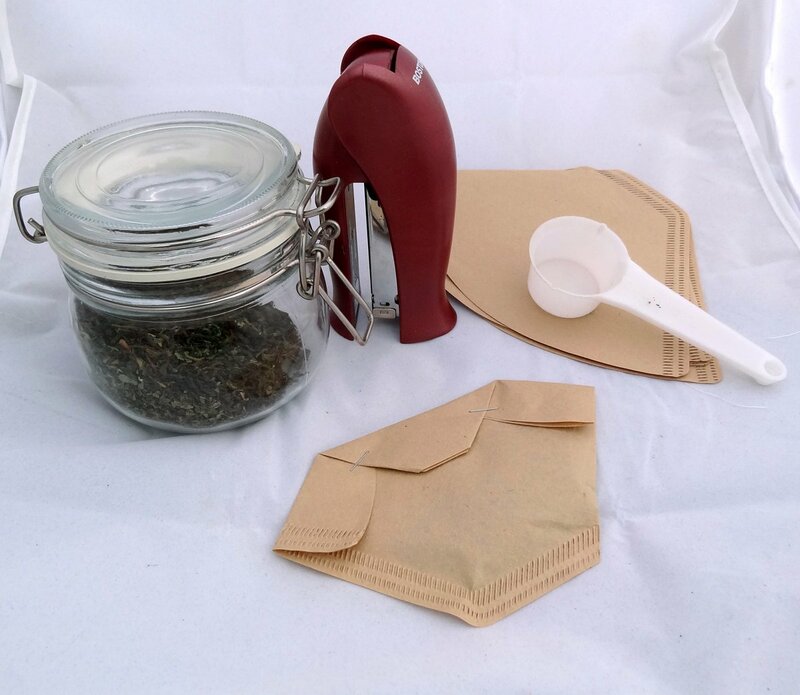 Making your own tea bags, for hot or cold brewing, is easy! Though it involves a few steps, it’s very simple- and though it looks like one of those things that might fall into the category of “Why bother? !” the process is quick and saves an impressive amount of money. 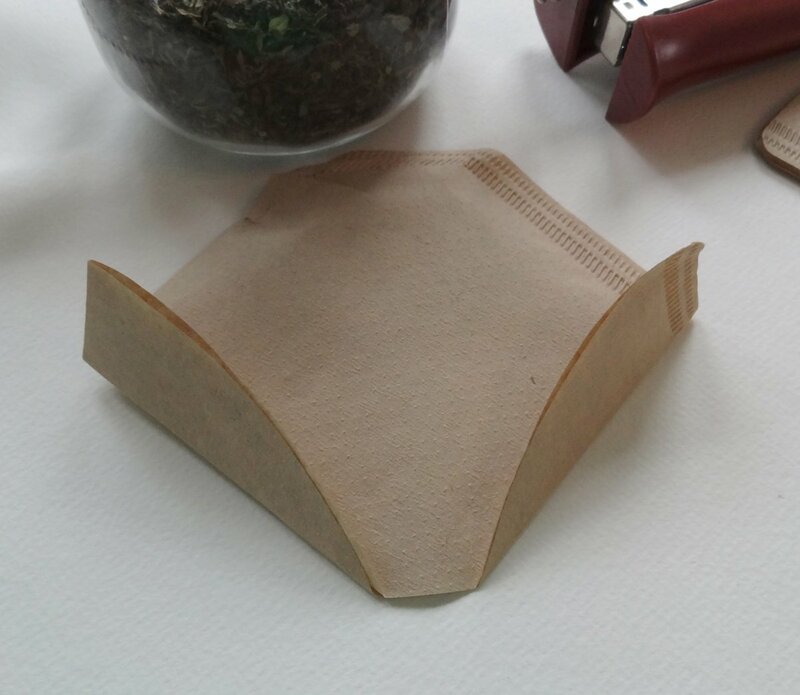 I experimented with a half dozen or so methods (brewing loose and straining, brewing in homemade cloth tea bags, various infusers, brewing in stitched paper tea bags, folding different ways, etc etc) and this method is by far the fastest and easiest and produces the highest quality tea. Purchased through Amazon, the Coffee Filters cost 4¢ each. + A 1 lb bag of Organic Gunpowder(**see note below) Green Tea (which makes about 25 tea bags) costs $9.99. 9.99 / 25 = 40¢. 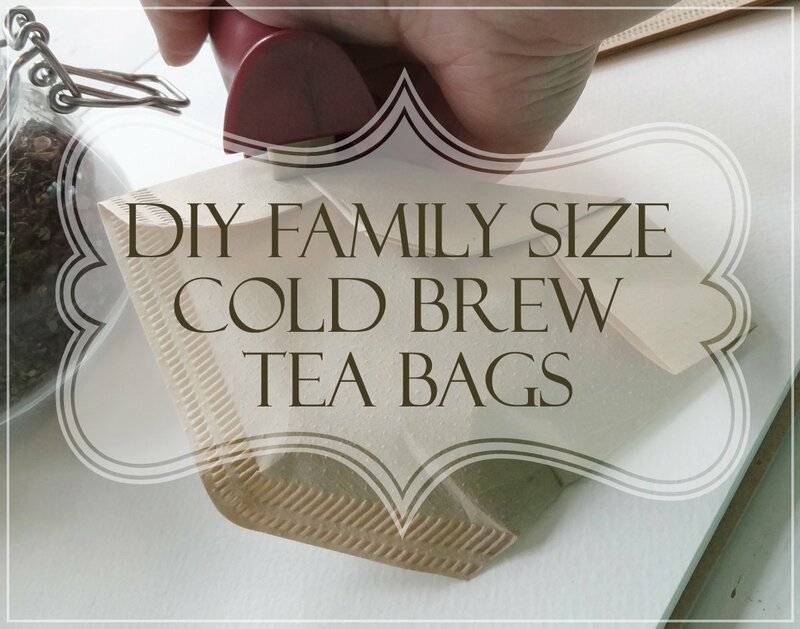 40¢ + 4¢ coffee filter = A cost of 44¢ for each two quart pitcher of tea. 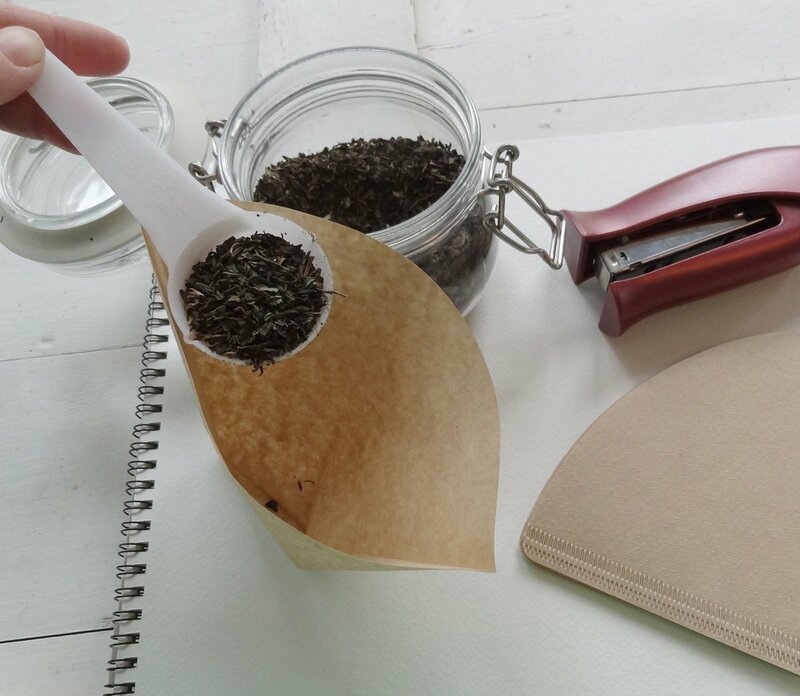 If you were to make the same amount of iced tea by using the necessary number of tea bags (generally, 8) of a non-organic value-brand tea, the cost per pitcher jumps to 80¢ per pitcher (and I used bulk pricing for my calculations!) The cost savings compared to prebrewed teas are even more dramatic. and small measuring cup or tablespoon. 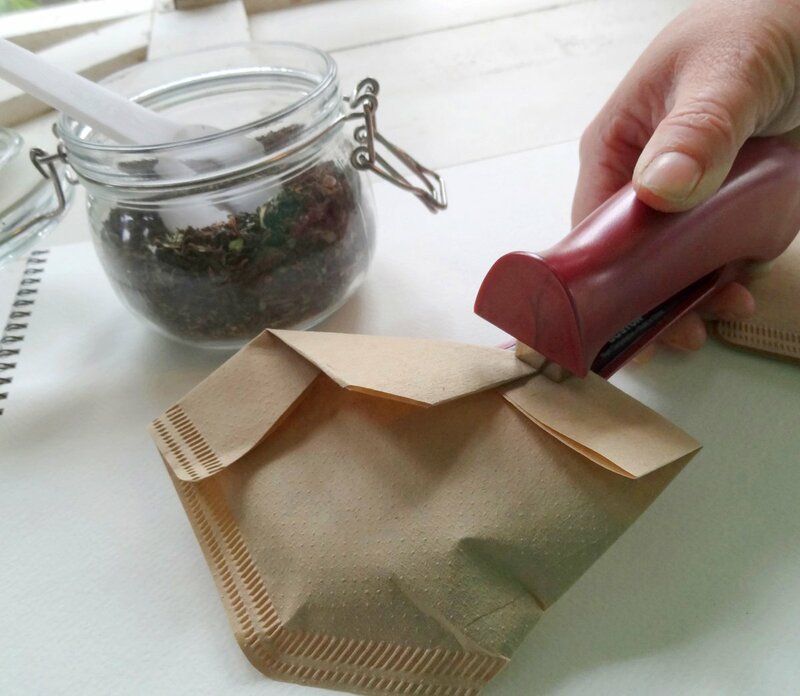 marker for labeling tea bags. 3. Next fold the top down, as shown. 4. Staple twice, making sure to secure all folds. 5. Store in an airtight bag or container to maintain freshness. 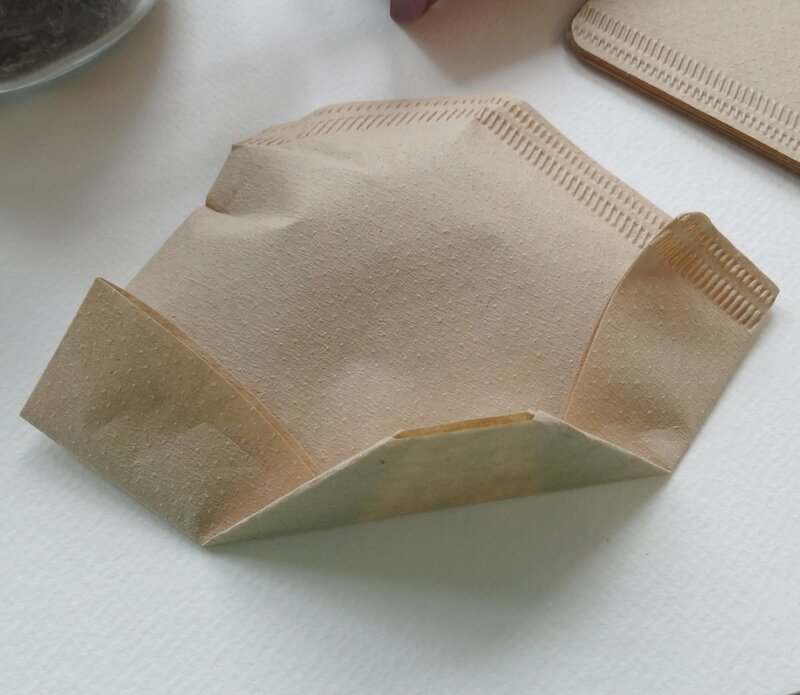 to mark my tea bags. Although they write like any marker, the dye in Food Doodlers is edible (and will dissolve into your tea during brewing). This type of labeling works best when done before filling the tea bag. I enjoy keeping things interesting by lemon juice or flavored stevia. Berry Liquid Stevia is especially good in the gunpowder green tea. This is a brilliant idea! I’ve been an avid tea fan for many years, but I’m just now exploring the possibilities of cold brewing. I’m dying to give this a try with some loose leaf vanilla chai I picked up at an international market a few weeks ago. Love this! 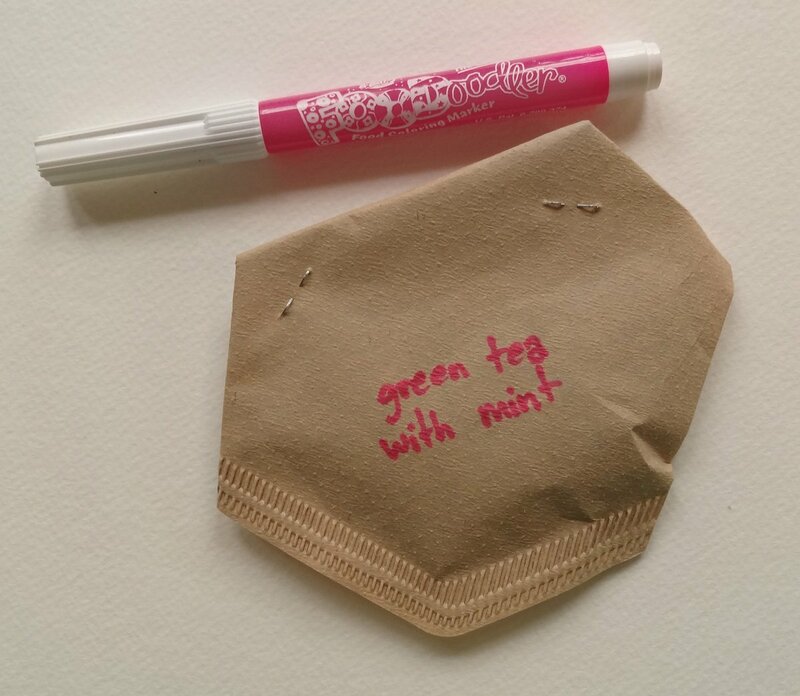 I’ve been drinking lots of tea and am looking for a mint tea in a quart size bag. Good solution. Thanks! Quart size bags are hard to find! What’s your favorite mint tea? I like Davidson’s Moroccan Green with Mint – but it’s only got just a hint of mint.